Even Miracles Require Raw Materials. The First Wednesday of Advent. The Third Class Feast of Saint Bibiana, Virgin & Martyr; and, the Commemoration of the First Wednesday of Advent. 10:25 AM 12/2/2015 — It’s painfully obvious that this event of feeding a hillside full of people with seven loaves of bread and a few fish has little to do with hunger or magic tricks as it does with feeding the world with the Body and Blood of Christ. And there is the symbolism of the Holy Eucharist all over this passage. For example, when He sits down with everyone gathered around Him, the first thing He does is heal the sick. Why? 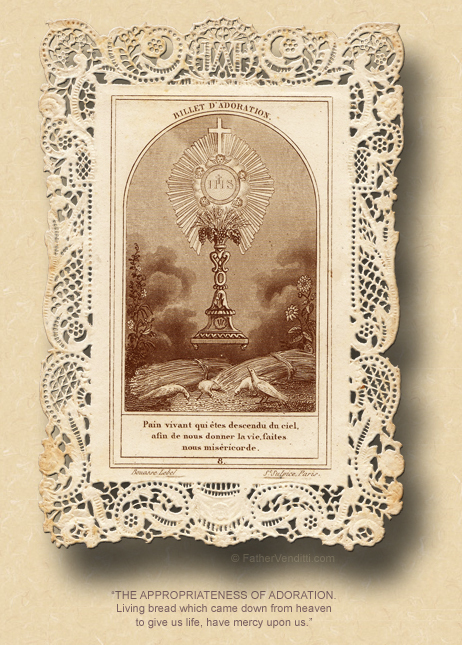 Because in order to receive Holy Communion one must be free from sin. That's why we offer confession here each day before Holy Mass: so no one can come here and not be able to receive worthily. When our Lord commands the disciples to feed the people with the meager supplies on hand, they complain that it won’t be enough; but our Lord presses them on, reminding them that what they are going to accomplish will be done by His power, not their own … just like a priest does at the altar: he doesn't change bread and wine into our Blessed Lord's Body and Blood; Christ does it working through him. Then after He breaks the bread, He gives the bread and fish to the disciples to distribute to the people; He doesn’t distribute it Himself. That’s because Christ entrusts the Holy Eucharist to His Church, particularly His priests, without whom there could be no Eucharist. Then Saint Matthew goes on to tell us that they all ate and were satisfied. Of course they were, because the Body and Blood of the Lord is not food in the conventional sense, but spiritual food, the actual life of the risen Savior. No ordinary food could satisfy that completely. And it wasn’t just some who were satisfied, nor even most: the Evangelist says that all were satisfied, because the Eucharist is the remedy for all sin, for all people. And when it was all over, they took up seven baskets of leftovers, in much the same way that we keep “leftover” hosts of the Blessed Eucharist in our tabernacles in church. And the baskets are left over because the Eucharist, once we partake of it, cannot remain dormant within us, but must be carried with us into the world, so that the life of Christ which we receive can be shared with everybody. And when the baskets are collected, Jesus and His disciples get back into their boat and move on, because the grace of the Eucharist must be spread to everyone. No one can attain heaven without it, as our Lord Himself said in Chapter Six of John’s Gospel, "… you can have no life in yourselves, unless you eat the flesh of the Son of Man, and drink his blood" (6: 54 Knox). 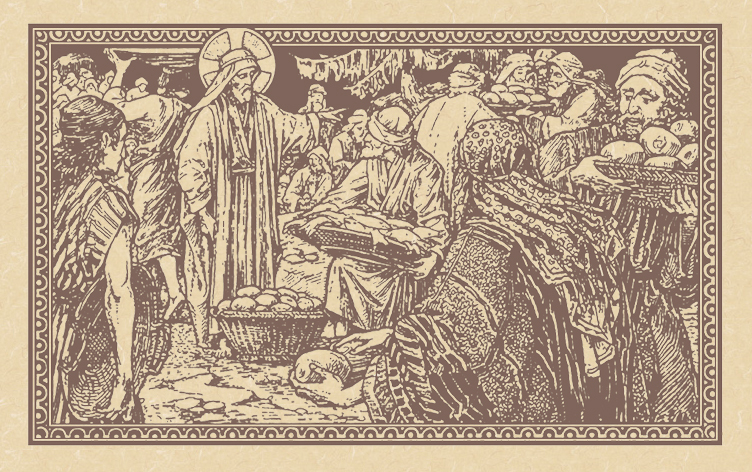 The Apostles had not yet received the power to consecrate and distribute the Bread of Heaven, the Eucharist; yet Jesus, with a symbolic act, to nourish the hungry crowd, did not create new food, but took that which was in the hands of His disciples, and blessed it. It explains a great deal about the Holy Priesthood and the sacraments: the priest is necessary to perform the mysteries, but it’s the power of Christ that makes them happen. And even in our own individual lives, everything we do that’s good is done by the grace of God acting through us. That being said, it is a fact that our Lord does not supply all of this miracle Himself: He still chooses to require the raw materials from us, just as he used the loaves and fish, meager and insufficient as they were, to feed the multitude; which surely points to the fact that grace is not completely a gift, but relies on our own efforts to make it work within us. And when we are open to receiving that grace, we can do what we were tempted to think was impossible. We can confront, for example, some moral teaching of the Church and say to ourselves, “Well, I can’t do this; it’s impossible!” almost as impossible as feeding a multitude of people with seven loaves of bread and a few fish. What makes it possible, of course, is Christ, who said, "With God, all things are possible." And so it must be with us. There is no burden that the Gospel imposes on us that cannot be met with the grace of Christ. Remembering that at all times, especially in times of temptation, can make all the difference. * The Typicon of the Byzantine-Ruthenian Metropolitan Church sui iuris of the USA contains observances of individuals particular to the Ruthenian recension whose causes have been introduced, but who have not been beatified or canonized, and which do not appear in the typicons of other Churches using the Byzantine Rite. No title, such as "feast" or "commemoration" is ever used for these observances, so I have invented one: "remembrance."